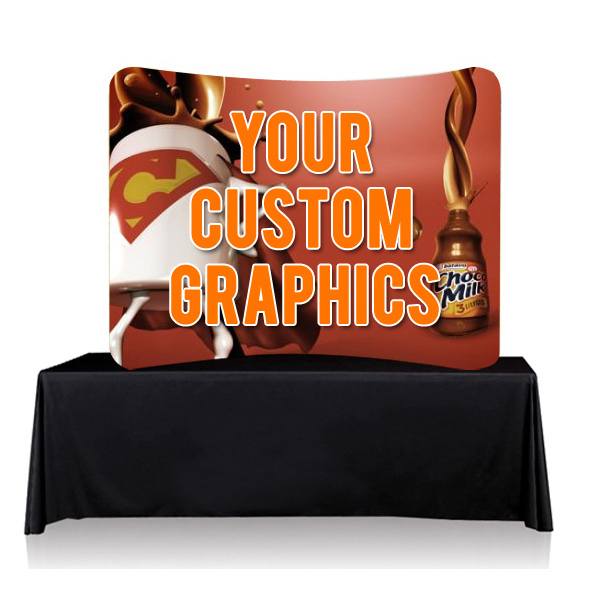 Trade show and Event Display Tube, 8 Ft. Curve Tabletop-Double advertisements. Our tubular systems are a great alternative to standard back wall displays. Because it gives the back wall life and doesn’t make your show room boring. Depending on what your curved table looks like it can light up the whole room. The full digital printed graphic display is ideal for indoor or outdoor booths, it is light weight and displays your company logo and any sale promotions you might have. Imprint size is 98” x 60” of fully colored graphics. One of the most popular features about this product is that it is a great item for trade shows. This item is great for spicing up your show room.